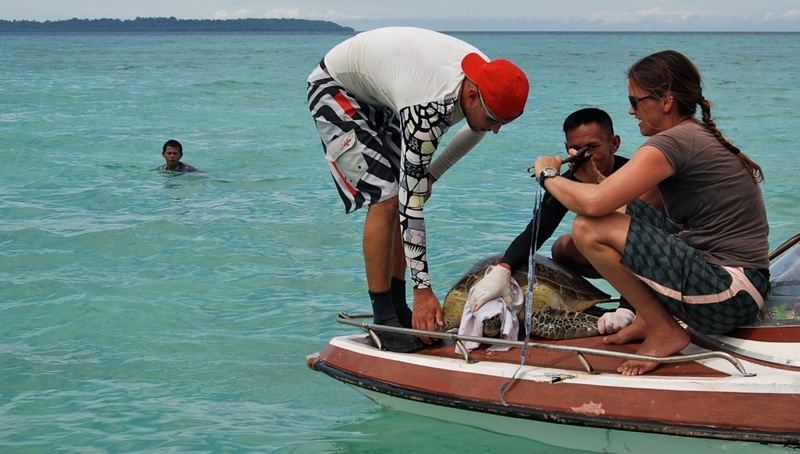 In total now we captured and measured more than 800 green turtles around Derawan and tagged 500 of them. The WWF guys (Udin, Darjon), some locals (Jeffrey, Tiar) and we catched them using the rodeo technique. This year we recaptured some individuals that we tagged previously in 2009 on Derawan Island. These turtles grew 3-6 cm (curved carapace lenght) or 3-10 kgs. On her first day on Derawan my sister Sabine saw green turtles in all kind of sizes and activities; she saw an female laying eggs, and small hatchlings coming out of their nest and she was my research assistant while cathcing green turtles in the seagrass meadow. Again a lot of pictures, enjoy because this will be the last pictures from the field for a while!